On the occasion of the 8th European Continental Younger Cadets, Cadets and Junior Championships in Rakvere on 26 October, H.E. Ms. Yoko Yanagisawa, Ambassador of Japan held the ceremony of 2018 Spring Conferment of Decorations on Foreign Nationals to award the Order of the Rising Sun, Gold and Silver Rays upon Mr. Riho Rannikmaa for his contribution to promoting sumo and judo as well as understanding of Japan in Estonia. At the ceremony, where Mr. Rannikmaa was surrounded by his family and those affiliated with sumo, Ms. Yanagisawa introduced the achievements of Mr. Rannikmaa and bestowed the order and the patent of the order upon him. In his remarks, Mr. Riho Rannikmaa mentioned the decoration is of his great honor and conveyed his deepest appreciation to his wife for her support. He also highlighted the importance of Kanō Jigorō's teachings, because practicing Judo and learning about the principles helped him to deepen his understanding about Japan. On the occasion of the 8th European Continental Younger Cadets, Cadets and Junior Championships in Rakvere on 26 October, H.E. Ms. Yoko Yanagisawa, Ambassador of Japan held the ceremony to grant the 2018 Foreign Minister´s Award to Mr. Kaido Höövelson (Baruto) for his great contribution to promoting mutual understanding between Japan and Estonia. At the ceremony, where Mr. Kaido Höövelson (Baruto) was joined by his family and those affiliated with sumo, Ms. Yanagisawa introduced the achievements of Mr. Höövelson (Baruto) and presented the award certificate and a commemorative gift to him. In his remarks, Mr. Kaido Höövelson (Baruto) thanked for the recognition of his achievements and he said he wishes to be the bridge between the two countries to promote friendly relations between Estonia and Japan as cultural ambassador. He also extended his thanks to those, who have supported him and wanted to share the joy with everyone. 2. October, H.E. Ms. Yoko Yanagisawa, Ambassador of Japan held the ceremony to grant the 2018 Foreign Minister´s Award to Järveotsa Gymnasium for the contribution to promoting Japanese language education in Estonia. The ceremony was held at Järveotsa Gymnasium, where the teachers, students and other affiliates like the Elder of Haabersti District had gathered. The Ambassador Ms. Yanagisawa introduced the achievements of Järveotsa Gymnasium and presented the award certificate to the school director Ms. Siret Paasmäe as the representative of the Järveotsa Gymnasium. In her remarks, Ms. Paasmäe expressed her gratitude for receiving the award on behalf of the former and current students, teachers and staff for this a great honor for everyone. She highlighted the importance of bilateral relations between Estonia and Japan in the field of education. Ms. Paasmäe thanked again the current and previous students, who are not only good at learning the language and culture, but also dedicated to sharing the knowledge with Estonians. 1. On August 30, 2018 the exchange of diplomatic notes for the entry into force of the Convention between Japan and the Republic of Estonia for the Elimination of Double Taxation with Respect to Taxes on Income and the Prevention of Tax Evasion and Avoidance (signed on August 30, 2017) took place in Tallinn. (b) with respect to taxes levied not on the basis of a taxable year, for taxes levied on or after January 1, 2019. The Government of Japan announced on 29 April the 2018 Spring Conferment of Decorations on Foreign Nationals. Mr. Rannikmaa has been awarded the Order of the Rising Sun, Gold and Silver Rays for his contribution to promoting sumo and judo as well as understanding of Japan in Estonia. On 22 March, 2018, the Ambassador of Japan, H.E. Ms. Yoko Yanagisawa presented the Order of the Rising Sun, Gold and Silver Rays upon Mr. Artur Veeber, film director and organizer of the festival JAFF (Japanese Animation Film Festival). The Government of Japan announced on 3 November the 2017 Autumn Conferment of Decorations on Foreign Nationals. Among 149 foreign recipients is Mr. Artur Veeber, who was awarded with the decoration for his contribution to disseminating Japanese culture and promoting understanding of Japan in Estonia. Ceremony was held at the ambassador´s residence, where Mr. Veeber was joined by his family and colleagues. In his remarks, Mr. Veeber shared his memories about the challenges they overcame during the first years of the festival, highlighted some milestones for example in 2017 the festival was held in four cities Tallinn, Tartu, Pärnu and Narva. He expressed great honour at receiving the decoration, and conveyed his gratitude to his family, friends, and all those affiliated with the festival for their support. Mr. Veeber finished his speech with a poem, in which he took inspiration from the tradition of Japanese poetry. JAFF has been organized by Otaku NPO, led by Mr. Veeber, in collaboration with Japan Foundation since 2007. The festival has raised interest towards Japanese films and the Japanese culture in general. In addition to film screenings, also pop-culture related events, exhibitions and workshops are held. In 2018 the 12th festival will take place (13.04-23.04.2018). The Government of Japan announced on 3 November the 2017 Autumn Conferment of Decorations on Foreign Nationals. Mr. Veeber has been awarded “The Order of the Rising Sun, Gold and Silver Rays” for his contribution to popularizing Japanese culture and promoting friendly relations and mutual understanding between Japan and Estonia. From 5th to 10th of April 2016, H.E. Mr. Taavi Rõivas, Prime Minister of Estonia visited Japan. On 8th of April, Prime Minister Rõivas met with Mr. Shinzo Abe, Prime Minister of Japan. They held a joint press conference and attended dinner hosted by Prime Minister Abe. A business delegation headed by Minister of Entrepreneurship, H.E. Ms. Liisa Oviir accompanied the Prime Minister. On 7th of April, the delegation attended an international conference hosted by Japan Association of New Economy and visited Japanese companies and other institutions. Mr. Heikki Vallaste, President of the Estonia-Japan Association was recently decorated for his contribution to the promotion of friendly relations and mutual understanding between Japan and Estonia. On 9 June, Ambassador Kai and Mrs. Kai congratulated Mr. Vallaste on his decoration, receiving him and Mrs. Marianne Vallaste at their official residence with other guests. Alari Allik successfully defended his doctoral thesis “Multiple Selves of Chōmei / Ren’in“ at the Estonian Institute of Humanities, Tallinn University on May 22nd, 2015. This is the first doctoral thesis on Japanese studies in Estonia. Alari Allik’s doctoral thesis was supervised by senior researcher Professor Rein Raud from Tallinn University and Professor Rajyashree Pandey from London University. His opponents were fellow Professor Eneken Laanes from Tallinn University and Professor Saeko Kimura from Tsuda College (Japan). Alari Allik is presently the head of the Asian Studies Department. He has translated Japanese classical literature into Estonian, including "Saigyō´s Poems of a Mountain Home" (2012) and "Hyakunin Isshu" (2014). Alari Allik received his MA from the University of Helsinki and BA from the Estonian Institute of Humanities. He was a Japanese Government Scholarship student at the Tōkyō Gakugei University (1995-1996) and a recipient of the Japan Foundation grant "Japanese-Language Program for Specialists (Specialists in Cultural and Academic Fields)" to conduct research at the Japan Foundation Japanese-Language Institute, Kansai (2013-2014). 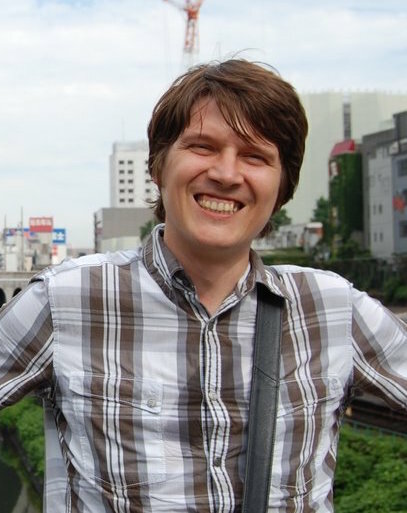 Alari Allik was elected as the first Chairman of the Estonian Association of Former University Students of Japan. On April 29, 2015, the Government of Japan announced the foreign recipients of the 2015 Spring Imperial Decorations. Among 85 foreign recipients is Mr. Heikki Vallaste, President of the Estonia-Japan Association, who will receive the Order of the Rising Sun, Gold Rays with Neck Ribbon, in recognition of his outstanding contribution to the promotion of friendly relations and mutual understanding between Japan and Estonia. On November 27, 2013, the General Assembly of the Japan-Estonia Friendship Group of Diet members (The Friendship Group of the Japan side) was held in Tokyo. Mr. Yoshitada Konoike has become Chairman and 33 Diet members of the House of Representatives and the House of Councilors join the Group.